[135 Pages Report] The forage seeds market was valued at USD 9.91 billion in 2016 and is projected to grow at a CAGR of 9.81%, to reach a value of 17.37 billion by 2022. The basic objective of the report is to define, segment, and project the global market size of the forage seeds market on the basis of type, livestock, species, origin, form, and region. It will also help to understand the structure of the forage seeds market by identifying its various segments. The other objectives include analyzing the opportunities in the market for the stakeholders, providing the competitive landscape of the market trends, and projecting the size of the forage seeds market and its submarkets, in terms of value (USD million) and volume (KT). This research study involved the extensive use of secondary sources, which included directories and databases—such as Hoovers, Forbes, Bloomberg Businessweek, and Factiva—to identify and collect information useful for a technical, market-oriented, and commercial study of the forage seeds market. The primary sources that have been involved include industry experts from the core and related industries and preferred suppliers, dealers, manufacturers, alliances, standards & certification organizations from companies; and organizations related to all the segments of this industry’s value chain. 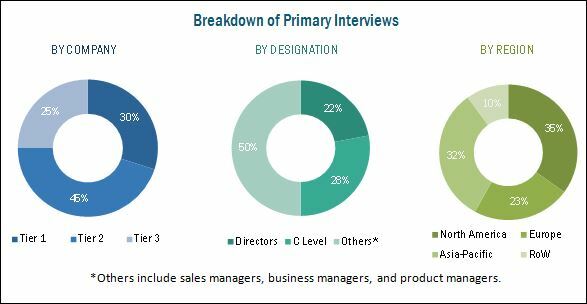 In-depth interviews have been conducted with various primary respondents such as key industry participants, subject matter experts, C-level executives of key market players, and industry consultants to obtain and verify critical qualitative and quantitative information as well as to assess future prospects. The following figure depicts the market research methodology applied in drafting this report on the forage seeds market. Key participants in the forage seeds market are the forage seeds manufacturers, suppliers, and regulatory bodies. The key players that are profiled in the report include the Monsanto Company (US), Land O’Lakes (US), Advanta Seeds Pty Ltd (India), Brettyoung (Canada), Barenburg Holdings B.V. (Netherlands), Allied Seed, LLC (US), AMPAC Seed Co. (US), Imperial Seed Ltd. (Canada). 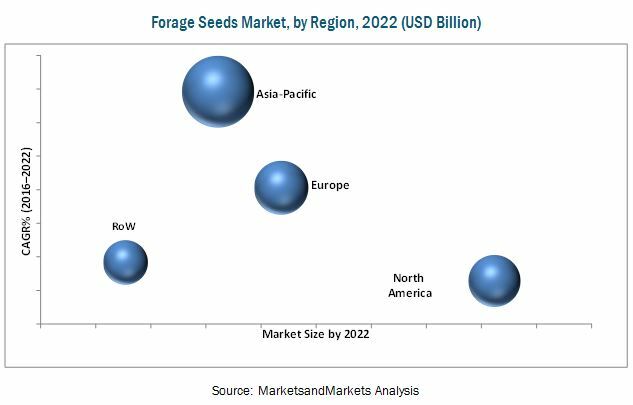 The forage seeds market is estimated at USD 9,913.5 million in 2016 and is projected to reach USD 17,377.2 million by 2022, growing at a CAGR of 9.81% during the forecast period. Increase in demand for quality feed products and growth in livestock populations are resulting in the growth of forage seeds market. Forage seeds provide essential protein, fiber, and energy to the livestock, which results in increased yield and also helps save costs incurred on adding additional protein and supplement additives. Based on type, the market has been segmented into alfalfa, clover, ryegrass, and chicory. The alfalfa segment dominated the market in terms of value in 2016. It is primarily used for feeding cattle, goats, horses, sheep, and dairy cows. Alfalfa improves the growth rate of the livestock by improving their digestibility and intestinal health. It also helps increase the yield of the livestock with an improved quality livestock production. In terms of type of livestock, the cattle segment accounted for the largest share of the forage seeds market in 2016. The quality of milk and meat products depends on the quality of feed fed to the cattle. Forage seeds are added to the cattle feed by livestock producers to ensure optimum production and performance. They help to improve the milk quantity and enhance the immune system of cattle, leading to greater feed efficiency. In the species segmentation, the legumes segment accounted for the larger share of the forage seeds market in 2016. Manufacturers have been using legumes to cultivate pastures and hayfields. Legumes have nitrogen-fixing nodules on their roots, which helps in fixing the atmospheric nitrogen. Forage legumes improve the health of animals, by providing essential nutrients such as proteins. Their production is a cost-effective method for enhancing the quality of livestock feeds. Legumes enhance soil fertility, thereby reducing the cost of crop production and livestock feed. Asia Pacific is projected to be the fastest-growing market for forage seeds during the forecast period. The Asia Pacific market experiences the maximum consumption of forage seeds due to the rising demand for animal feed, reduction in the availability of grazing land, and increase in demand for dairy products. Key players in the forage seeds market focus on research & developments to develop innovative forage seeds that provide nutrients such proteins and vitamins to livestock through their feed. The challenges faced by the forage seed manufactures include preference of feed quantity over feed quality, lack of seeds and planting materials in developing regions, and reduction in seed yields due to excess soil water, drought, and weeds. Such challenges hamper the forage seeds market. Players such as DowDuPont (US), Monsanto (US), Land O’Lakes (US) and Advanta Seed Ltd. (India) have been actively strategizing their growth plans to expand in the forage seeds market. These companies have a strong presence in Asia Pacific and North America, and also have manufacturing facilities and a strong distribution network across these regions. 13.4 Land O’ Lakes, Inc.